bladeRF with Linrad on HF via J61. The bladeRF hardware is available from NUAND The unit uses a chip from Lime Microsystems, the LMS6002D. The nominal frequency coverage is 300 MHz to 3.8 GHz. The unit can also be used from DC to perhaps 18 MHz as a two channel HF receiver. The hardware is a transceiver. This page is only about how the receiver is implemented in Linrad and what performance data is observed. To use the bladeRF as a HF receiver, select input from J61 in Linrads setup menu. The two inputs are balanced and can be used with a small transformer as shown in figure 1. Fig. 1. The input to J61 is via two toroid transformers. The transformers have a bifilar winding with 2 times 15 turns connected in series. The end points are connected to P and N inputs of tha A/D converters while the midpoints are decoupled and supplied with a voltage divider through which a DC bias is supplied. The secondaries are loaded with 680 ohm resistors. The primary winding with 10 turns provides a reasonable match to 50 ohms. 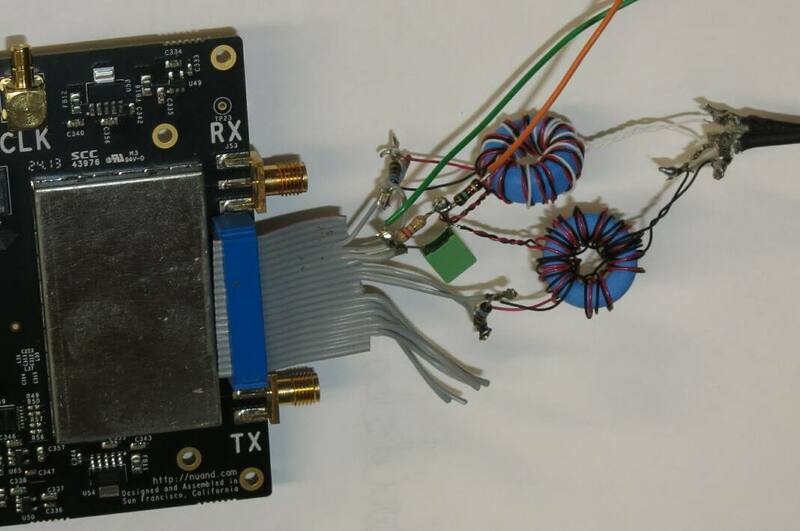 The -3dB points of the transformer input are 40 kHz and 20 MHz. Figure 2 shows the screen with a good crystal oscillator on 2.509 MHz connected to channel 1 and a HP8657 signal generator on 2.505 MHz connected to channel 2. The signals are about 1 dB below saturation. It is clear that the crystal oscillator is much better than the HP generator and that phase noise is not a problem with the A/D converters. The sampling speed is 10 MHz. Spurs caused by overtones are visible since 2.5 MHz is the Nyquist frequency. The signal level is -6 dBm in channel 2. Fig. 2. Two signals sampled at 10 Mhz. See text. Figure 3 shows the noise floor at a frequency separation of 100 kHz. Both inputs have the same signal level. Linrad was first tuned to a signal that was 1 dB below saturation on 2.509 MHz. The average level on the S-meter was then about zero. Then a point about 100 kHz higher was clicked which caused the noise to drop to an average level of about -98 dB. Switching off the signal caused the noise to drop another 3 dB. The bandwidth is 500 Hz so the noise floor is at -125 dBc/Hz for a signal 1 dB from saturation in channel 2. Channel 2 is about 4 dB more sensitive than channel 1 but the dynamic range is the same. In figure 3 the sampling rate was set to 40 MHz with Linrad running on averages of four samples. The noise floor is dominated by interference pick-up due to inadequate screening. Fig. 3. The noise floor at a frequency separation of 100 kHz. See text. The weak point when using the direct A/D on the bladeRF the A/D linearity. Figure 4 shows two signals of equal amplitude. The level is about 39 dB below saturation in both channels. The signal at the frequency where third order intermodulation normally occurs is only 25 to 30 dB below the main signal. This can not be third order intermodulation, it is probably digital feedback. Signals of order up to 19 are visible. 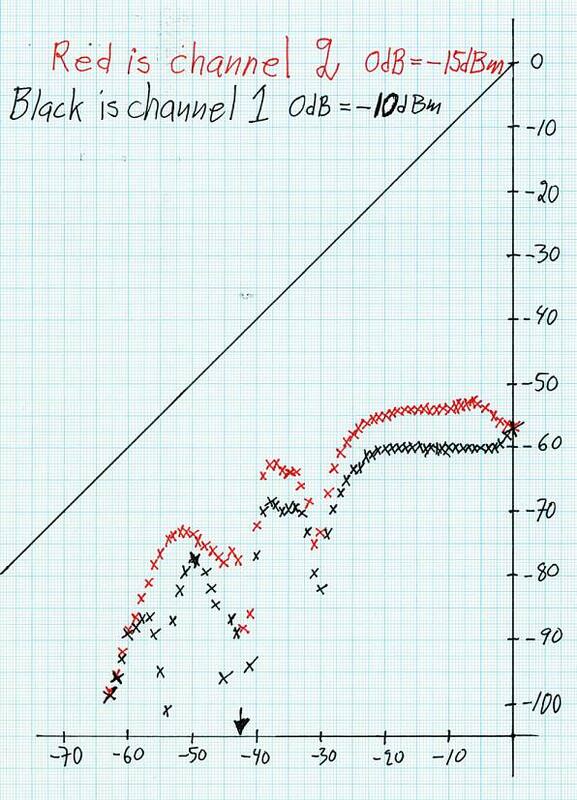 Read about the phenomenon here Dynamic range observations for the SDR-14 and in this QEX article IMD in Digital Receivers QEX Nov/Dec 2006, pp 18 - 22. Fig. 4. Two signals at about -54 and -49 dBm. The level is about 39 dB below saturation in both channels. Figure 5 shows how the level of the level of the false signal on the frequency of third order intermodulation varies with the frequency. This is not Intermodulation. The problem does not exist when the tuner is used for input so the digital feedback may be due to a layout problem with the wires that go to J61 but it may also be something internally in the chip. Fig. 5. The signal level at the frequency of third order intermodulation as a function of the input signal level in dB below saturation.